GROUND ZERO PLUS 1260 DAY--New York, NY, Monday, February 21, 2005--Large, pristine crystals of ice carved magically into winter's fingerprints fell fortuitously from the gauzy morning sky upon the bare branches of New York City's 26,000 trees in Central Park, framing the naked branches with the innocence of winter. 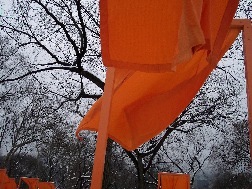 Just a few inches below the tapering branches whipped millions of miles of saffron thread, woven into the 7,500 cream sickle-colored banners hung by Christo and his wife Jeanne Claude as part of the Big Apple's tribute to environmental art lovingly termed by the creators: "The Gates." 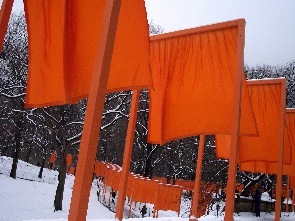 Detractors of the art project that took more than 26 years to get approved refer to the saffron color of the gates as a kind of "cheesey macaroni" blend that "robs" Central Park of its natural nature and intrudes human footprints on a natural 843-acre sanctuary for the eight million concrete-trapped citizens of a city with more than 10,000 miles of sidewalks and buildings that rise so high they block the sunrise and sunset, even the night stars. On the other hand, guys like myself, relish the magic of human nature to overcome the obstacles that stand in the way of expression, and find the presence of The Gates a symbol not of detraction or denigration but of attraction and revelation of what humans are capable of achieving despite all the reasons to fail. 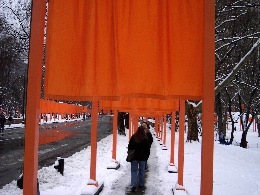 Christo and his wife are not strangers to the Principles of Vigilance, for Vigilance is not about "victory" but about pursuing what is right despite all the barricades life erects along the way. 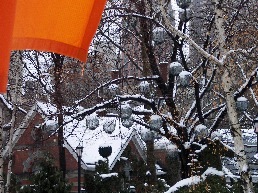 Perhaps that's why the snowfall was so magical last night. More than three inches fell from eight p.m. last evening until early this morning. 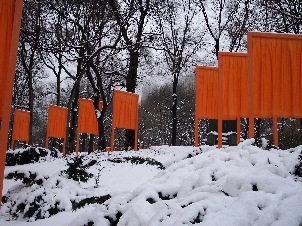 I arose just before six this morning and donned my camera gear to capture the magic of snow on The Gates. 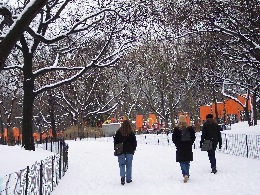 Here, in Central Park, three colors existed: the white of snow, the dark of naked bark, and the bright, illuminating saffron of The Gates, whipping lightly in the wind as snowflakes warmed into light drizzle. Life is about finding exclamation points within its most common sentences and often drab punctuation. The Vigilant Person is looking constantly for the "next miracle," the next "piece of magic" that spurs the value of life and its endless adventures on to the next station where, stepping off for a few fractional moments, one can inhale the ecstasy of being alive to enjoy whatever presents itself as "worthwhile." 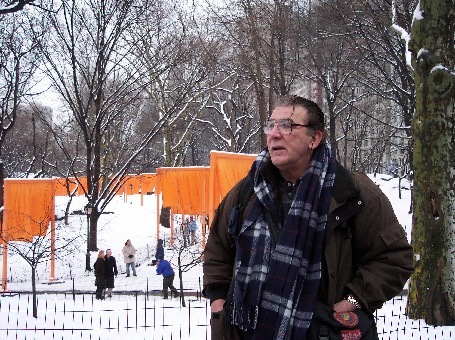 Even the skeptics who consider the Christo Central Park art an invasion and travesty would have to admit that seeing the park filled with the virginity of newly fallen snow framed in countless rippling repetition by thousands of saffron gates standing sixteen tall and staggered at twelve-foot intervals wasn't, in some small measure, the result of a magic wand waved over the complacent convention that Central Park was indeed beyond the scope of human imagination. 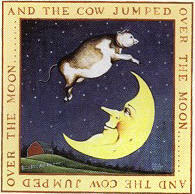 This imagination of what could be despite all the forces against "what could be" is the Power of Vigilance. Vigilance preserved when Terrorism might have won. 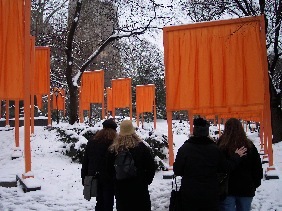 Long ago, the Christo team might have given up the seemingly fruitless effort to get New York City to capitulate to having the 150-year-old park surrender itself to the artistic dream of a couple of people, especially those who speak with accents and claim their art has "no meaning." Some might say they are Seinfield's of the art world, that like the famed television series that was a tv show about "nothing," that in the ultimate sense The Gates are equally about "nothing." Logically, if one studies what logic is, they would know that "nothing" is truly "everything" in its purest form, for it is the sum of all that isn't and is at the same time, thereby reducing the emptiness to fullness, the zero to a one, black into white. 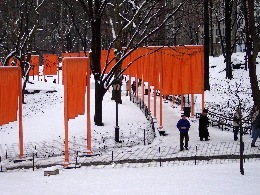 But only seeing The Gates in the crestfallen snow could underscore this message. 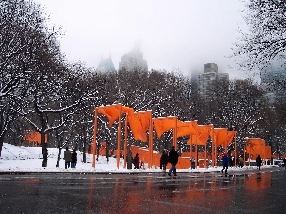 There it was, the nothingness of art marching through the everythingness of Nature, neither obtrusive or intrusive, coexisting with the naked branch as though each of the 7500 steel saffron frames were life in a dormant form, waiting for the blush of Spring to return to life. That won't happen, for The Gates only exist for a life of sixteen days. 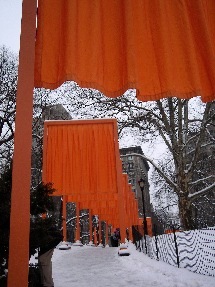 Before the snow that fell last night has melted, The Gates will disappear. But their shadows will remain. Central Park allowed into its womb the Sentinel of Gates Vigilance. Never will the history of the park be free from the memory of The Gates Standing guard over the ideals of human effort and the power of human dreams. 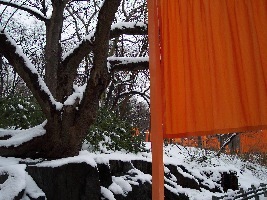 The real benefactor of seeing The Gates draped in snow are the children who dream about the impossible and improbable. If they enjoy Parents of Vigilance, their parents or loved ones will tell them about how two people had a dream and worked to make it happen. 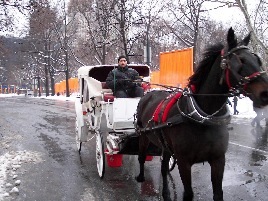 They will share how hard the two struggled to keep alive the belief that one day their "Gates" would march through Central Park, and, because they surrender the Beast of Terror Thoughts, that day came to pass. 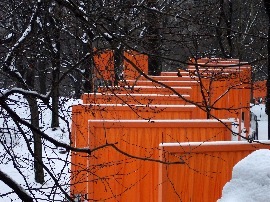 They will tell their children that seeing The Gates go up and the snow fall on them is like watching a live cow jump over the moon and dish run away with a spoon. They will tell the child it is the same magic that made every fairy tale spark to life, and that any dream that the child has must be treated with the utmost respect and cared for with the same tenderness of a loving parent for a new child. Such a parent will remind the child there will be those "Dream Killers" who, like a "Terrorist" will attempt to destroy the belief in the child's imagination by doing and saying all sorts of things to sway the child from holding tight to his or her dream. 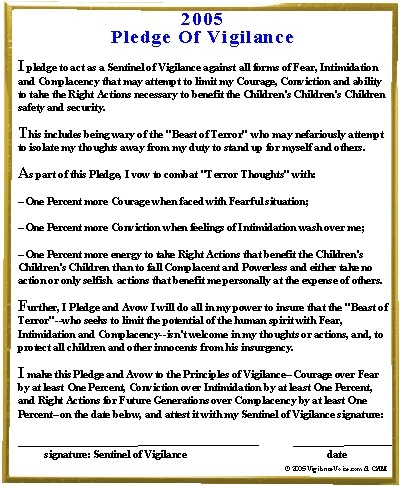 This parent or guardian will remind the child that some people will ask the child to throw the dream away, to cast it aside as excess baggage that only belongs to children and not to adults, and who will try and rip it from them under the disguise of advice and under the banner of maturity. Such efforts, the parent will explain, are nothing less than ways to steal the treasure of life from someone, and that treasure consists of one's dreams and beliefs in the improbable and impossible. If one surrenders to such pressures, the wise parent will say, part of them dies. They become numb inside. Complacency sets in. And, every time they attempt to dream in the next thing, fear of failure looms large until there is nothing left but breathing in and out, with no snowfall, no adventure, no hope, no dreams of what can be. The Gates have been and are for the children. All Sentinels of Vigilance are for the children. 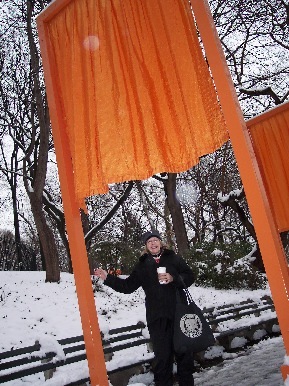 The snow in Central Park, roosting on the frames of the 7,500 gates, is our reminder of innocence, and our need to preserve it not only in our children and loved ones, but in ourself. We can do that by taking the Pledge of Vigilance. Go To February 19 Story: "Uncommon Valor Was A Common Virtue"